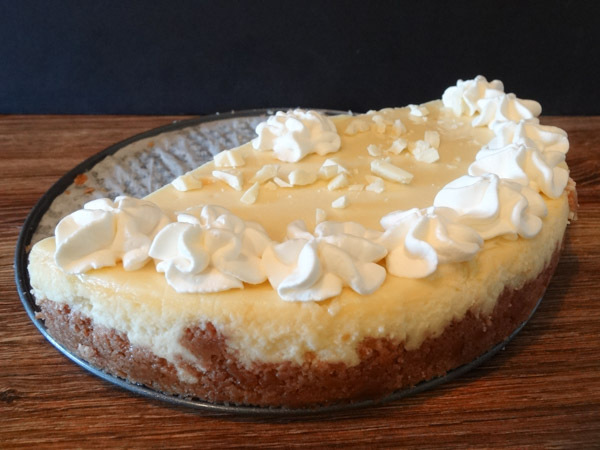 This White Chocolate Cheesecake is a luxurious and decadent dessert for cheesecake lovers. A great treat for the holidays or a special occasion. 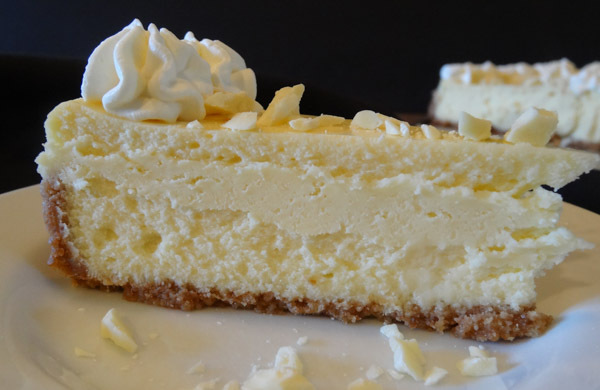 At first glance, this cheesecake looks a little plain, but take a bite, and you’ll immediately know that this isn’t an ordinary cheesecake. The addition of white chocolate gives this cheesecake an extra depth of richness and smoothness. Start off with room temperature ingredients. 2. 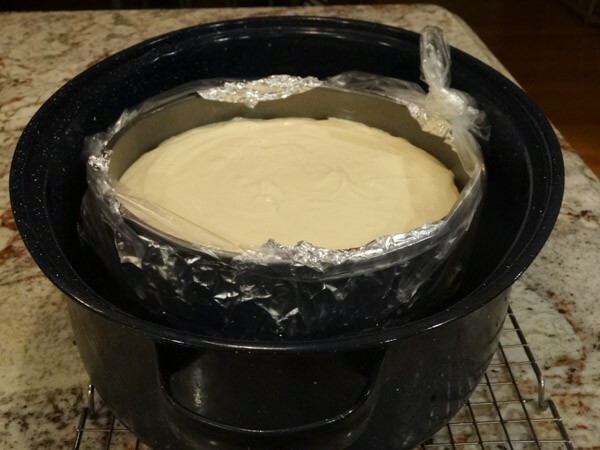 Use a water bath to bake the cheesecake. This ensures even baking and prevents cracking. 3. Wrap outside of springform pan with aluminum foil or secure with slow cooker liner. You’ll want to start off by making the crust. I used a graham cracker crust with just a hint of cinnamon to compliment the white chocolate. I’ve seen some people use a chocolate crust as well. It’s strictly just a matter of personal taste. 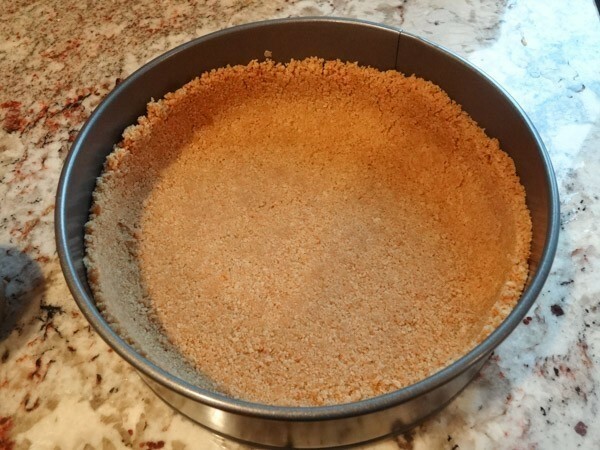 I preferred using the graham crackers as I didn’t want the chocolate crust overpowering the white chocolate. Pulse graham crackers in food processor until finely crumbled. It should measure 1 1/2 cups. Add cookie crumbs to bowl of melted butter. Add in granulated sugar and cinnamon. Toss with fork until ingredients are well combined. If you decide to use Oreos, reduce the amount of melted butter by 2 tbsp. Press cookie mixture into bottom and partially up sides of 9 inch springform pan. Double wrap outside of springform pan with aluminum foil. Bake crust at 350 degrees F for 8 minutes. Remove pan to wire rack to cool. In large bowl, add in softened cream cheese and granulated sugar. Blend with electric mixer on medium speed for 2 minutes. Add in eggs, one at a time, and vanilla extract. Blend until well-combined. Add in melted white chocolate and sour cream. Blend until combined. 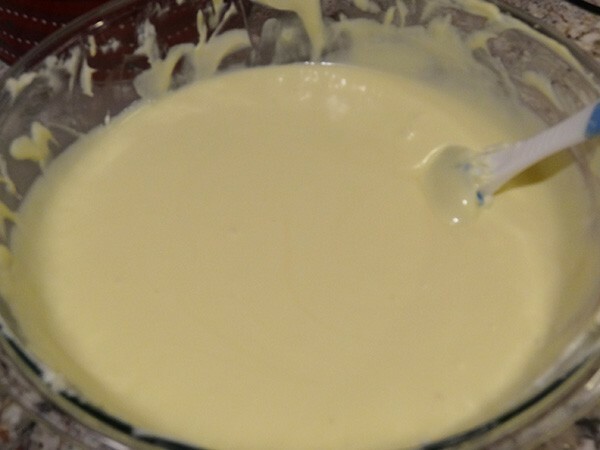 Batter will be smooth and thick. Although springform pans are great for making cheesecakes, they are notorious for leaking. I know I already mentioned double-wrapping outside of springform pan with aluminum foil. I also like to wrap outside of pan with a slow cooker liner for extra protection. This prevents any water from seeping in while in the water bath. 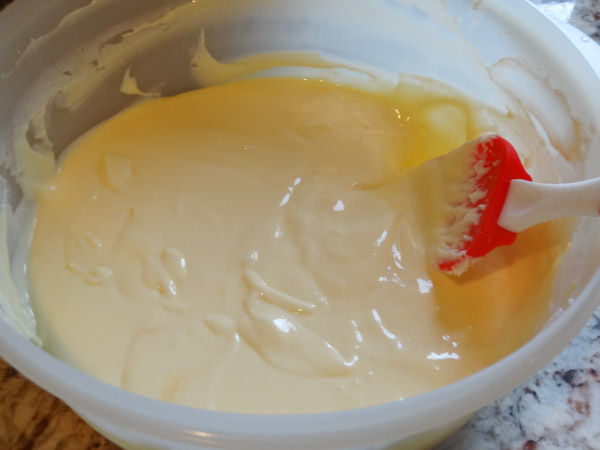 Pour cheesecake batter into the prepared springform pan. Smooth top with spatula as needed. Place springform pan into larger roasting pan and carefully add hot water so that water reaches halfway up springform pan. Bake at 325 degrees F for one hour, ten minutes to one hour, twenty minutes. Center of cheesecake should be jiggly. When I checked my cheesecake at one hour, ten minutes, the whole cheesecake was still jiggly. When I checked it ten minutes later, the perimeter was no longer jiggly and only the center was slightly jiggly. Turn off oven and crack door open. Leave cheesecake in the oven for an additional thirty minutes. Remove cheesecake from roasting pan and let cool on wire rack for another 30 minutes. Cover top with saran wrap or aluminum foil and refrigerate for at least 6 to 8 hours. Are you wondering where the rest of the cheesecake is? Well, here’s the story. I currently have a student doing her clinical internship at my work. Essentially, I’m supervising her as she treats my patient caseload during the day. It leaves me with a lot of extra time on my hands, so I decided to do some of my baking at work. Since my coworkers were tantalized with the aromas of a carrot cake and then a cheesecake baking throughout the day, it was only fair that I shared. They loved both desserts, but unfortunately I didn’t get a chance to take as many pictures as I usually do. I topped the border of cheesecake with homemade whipped cream and sprinkled chopped white chocolate as a garnish. Hope you enjoy this dessert! Please leave a rating or a comment if you had a chance to try this dessert. 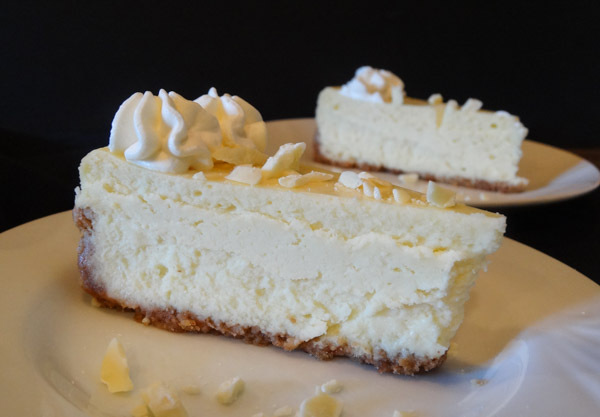 White Chocolate Cheesecake is a luxurious and decadent dessert for cheesecake lovers. Preheat oven to 350 degrees F. Double wrap outside of 9 inch springform pan with aluminum foil. 2. Use food processor to pulse graham crackers until finely crushed. 3. Add crushed graham crackers to bowl of melted butter. Add in sugar and cinnamon. Toss ingredients with a fork until well-combined. 4. Press cookie mixture into bottom and partially up sides of 9 inch springform form. 5. Bake at 350 degrees F for 8 minutes. Remove to wire rack to cool. 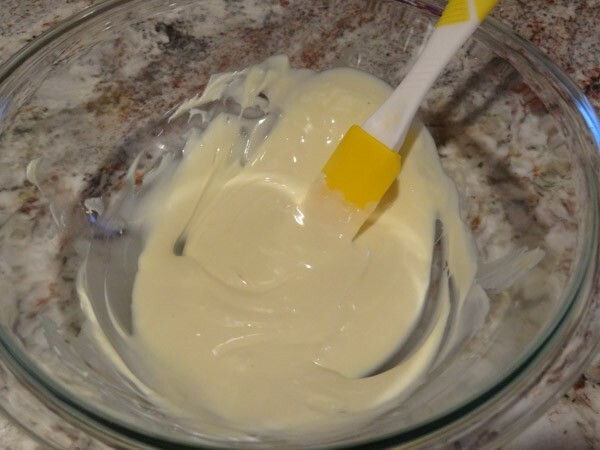 Melt white chocolate in microwave safe bowl, stirring every thirty seconds. (Should take approx one minute, twenty seconds). Set aside. 2. In large bowl, add in softened cream cheese and granulated sugar. Blend with electric mixer on medium speed for 2 minutes. 3. Add in eggs, one at a time and vanilla extract, blending until well-combined. 4. Add in melted white chocolate along with sour cream. Blend until combined. Pour batter into springform pan. Use spatula to smooth out top if needed. Make sure oven is preheated to 325 degrees F.
5. Place springform pan into larger roasting pan. Fill roasting pan with hot water until water reaches halfway up outside of springform pan. 6. Bake at 325 degrees F for one hour, ten minutes to one hour, twenty minutes. Center of cheesecake should be jiggly. Turn off oven and crack door open. Leave cheesecake in oven for additional 30 minutes. 7. Remove cheesecake to wire rack to cool for 30 minutes. 8. Cover top of springform pan with saran wrap or aluminum foil. Refrigerate for 6 to 8 hours. 9. Once chilled, run knife around edges of springform pan before releasing cheesecake from pan. 10. Keep this dessert refrigerated. In large bowl, add in heavy whipping cream, powdered sugar, and vanilla extract. 2. Blend on medium speed for 2 minutes. Turn speed up to high and continue to blend until soft peaks and then stiff peaks form. 4. Garnish with chopped white chocolate if desired. cookies and cream cheesecake or triple chocolate cheesecake.